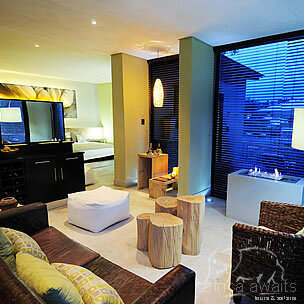 This intimate boutique hotel in a tranquil corner of Windhoek embodies the very essence of chic comfort. The Olive Exclusive - the first ultra-luxurious sanctuary of its kind in the Namibian capital - is cool, contemporary and stylish but with a warm heart and authentic African soul. Its sleek, modern lines are complemented by organic textures, natural furnishings, an eco-friendly approach and dedicated personal service. Simple elegance is key, from the organic rough-hewn wooden benches and side tables, through the sculpted chunk of granite that serves as a coffee table in the guest lounge, to walls clad in abstract Namibian landscapes by well-known South African photographer Micky Hoyle. The seven suites are individually decorated so each reflects a different region in Namibia, and each has its own lounge area with fireplace and dining room, for private dining. Wide glass doors open onto spacious decks where you can relax on a shady daybed, enjoy al fresco lunches or, if yours is a premium suite, take a dip in your own private plunge pool. Such are the creature comforts that you may find it hard to leave: sink into an extra-length bed dressed in crisp, pure-cotton linen, or indulge in a bubble bath in a freestanding tub with sweeping mountain views. Air-conditioning, satellite TV and iPod docking stations are standard, as is a computer with WiFi access. Then there’s a fully stocked mini bar, complete with a premium wine selection, so you can toast the setting sun in fine style. The Olive Exclusive boasts a quality restaurant featuring a seasonal menu, with inventive signature dishes. The fully stocked bar also features a classic selection of fine whisky. 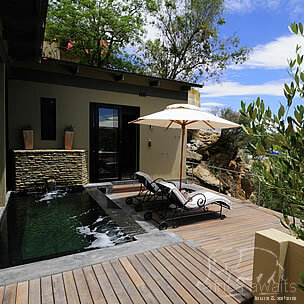 It’s the perfect luxury base from which to explore Windhoek and its surrounds before heading off on a Namibian safari. 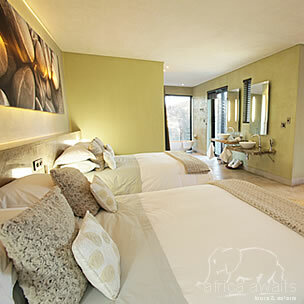 With your holiday, safari or business trip from in to The Olive Exclusive in Namibia.